This architect built an addition onto his home made of clay, straw and timber ~ an earthy, energy-efficient combination. Lou Host-Jablonski has a thing or two to teach the three little pigs about building natural homes. Instead of trying to figure out which is fastest, easiest or strongest for building a house--straw, twigs or brick--they should have gotten together and used all three. That's pretty much what Design Coalition architect Host-Jablonski did when he built an addition onto his 90-year -old Dunning Street home in Madison's Schenk-Atwood neighborhood. Granted, he used big twigs--timber, that is --to frame the space. And he didn't exactly use brick, but he mixed clay with straw to make the walls and floor. Add colorful banners to the second-story rafters lots of light, and you have an energy-efficient room that looks like a cross between a cozy barn and a Wisconsin white pine cathedral. "I've been interested in resource and energy-efficient building since architecture school in the '70s," said Host-Jablonski. "So I've been searching for years for construction techniques that are genuinely sustainable. "The use of straw and clay has been around for a thousand years and is used more in European countries and in Japan." "It's only in this century that we started building with synthetic, non sustainable materials," he said. "In a way, this was part of an experiment in how far I could go---how natural I could make something and still have it meet modern energy standards and have it be beautiful." If it's not quite as beautiful as Host-Jablonski envisions, it's because it still lacks the salmon-pink coating of earth plaster that will brighten the walls, and the linseed oil and bees wax finish that will smooth the cracked adobe floor. 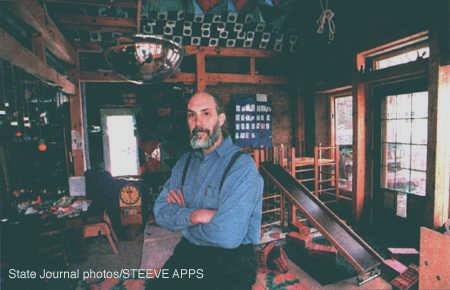 Yet there is an organic beauty in the exposed straw walls and wood lath, the wooden pegs used instead of metal nails in the timber frame, and in the way the space used by toddler and preschool children who attend Vic McMurray's first floor Bridges Family child Care center. Above: The exterior still needs some finishing work, but the interior is snug and energy efficient, Host-Jablonski says. Above: This interior view shows the straw-clay mixture that was used to fill the walls. 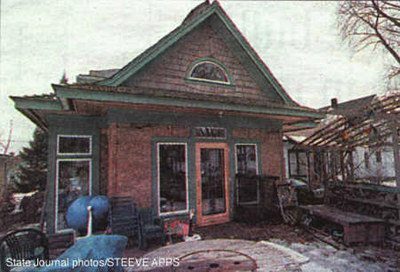 "We knew when we bought the house eight years ago in sad shape that it would need a lot of work," Host-Jablonski said. "The addition came about because my wife, Vic, who was a child-care worker, really wanted to have a family day care in our home. She wanted a space that works, with kid-friendly attributes, as well as a low-toxin environment for any children who might have environmental allergies." "As an architect, I have a responsibility to promote safe construction," he said. "I think of those who thought that asbestos was the miracle material and used it in buildings for decades only to find out it could actually kill people." 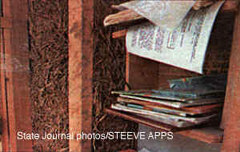 Besides the straw/clay construction, Host-Jablonski used Frank Lloyd Wright's idea of hydronically heated tubes going through the adobe floor so that the flooring is warm for little feet. "I really enjoy the experience of having an earth floor," said McMurray. "For me, it's sad to see how little contact children have with the earth as they walk down a sidewalk, get in a car, walk up a driveway and into a day care institution. My day-care kids are walking on the earth when they're in school here and it feels really close to being outside." "The children have been exposed to a variety of sensory experiences over the course of the project", said McMurray. "The first year---when we had walls up but no windows--I thought of the addition as a park shelter. We would put our coats on and go play out there. Then, before we put the earth floor in we had a gravel base, which the kids enjoyed too. In fact, when we mixed the straw and clay with water to make the walls, some of the seeds in the straw sprouted so there was a green beard of wheat grass growing out of the wall, which was wonderful." The project was quite cost-efficient, especially in terms of materials. Ingredients for the plaster read like an entry in an artist's cookbook: clay, sand, chopped wheat straw fibers and a bit of cooking oil, plus a finish coat of white silica sand mixed with white kaolin clay, then colored with a little potter's iron oxide. Some of the lumber was collected from curbside and the fir ceilings are resurfaced boards from porch demolitions. "We got the bales of hay from a farmer and actually dug up some of the clay from our yard," said Host-Jablonski. However, since the straw and clay walls were mixed on site rather than at a factory, labor costs would have been quite high if Host-Jablonski and his wife hadn't had volunteer help. "We've been working for about three years on this space on weekends, as well as using labor by students in Design Coalition workshops who were interested in studying natural home building techniques," he said. The couple have never really added up the costs, but think the addition was around $30,000. They hope to finish it this summer and move on to more conventional remodeling inside. But even after they move on to other projects, a beautiful arbor of twigs, timber, straw and clay made by students studying natural home building techniques will remain in front of the entrance to their home. It makes a nice frame for a message written in wet concrete on a porch step: Welcome Friends.